Discussion in 'The Sports section' started by KUCIAR666, Oct 12, 2017. Having recharged their batteries during the two-week break after the race in Aragón, the Movistar Yamaha MotoGP Team has flown to Japan to kick off the triple-header overseas, starting with Yamaha's home race at this weekend's Motul Grand Prix of Japan. Following a successful Yamaha dealer event in Tokyo earlier today, Movistar Yamaha MotoGP's Maverick Viñales and Valentino Rossi are on route to the Twin Ring Motegi track to commence the Motul Grand Prix of Japan. A fortnight ago, Viñales secured fourth place in Aragón. He currently holds third position in the championship standings and arrives in Japan ready for action at Yamaha's home race. He received a very warm welcome in Tokyo at today's KITTE event and aims to do the Japanese fans proud as he continues his MotoGP title quest. 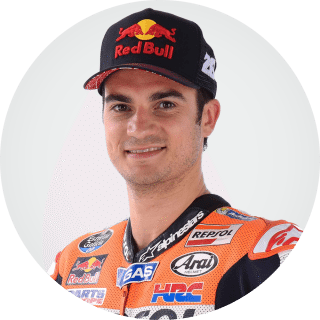 Since the Spaniard began his Grand Prix racing career in 2011, he has visited the Motegi podium four times, securing two second places at the Japanese Grand Prix in Moto3 (2012 and 2013), a second place in Moto2 (2014) and a third place in the MotoGP class last year. This year he hopes to climb the top step of the rostrum to add 25 points his tally and close the 28-point gap to first place in the championship standings. Teammate Rossi made a stunning comeback at the race weekend in Aragón, securing a brilliant fifth place, just 24 days after sustaining a leg injury. The nine-time World Champion used the last two weeks to further rehabilitate his right leg and expects he will be able to ride with more ease this weekend. In the past years, the Italian booked numerous successes at the Motegi track. 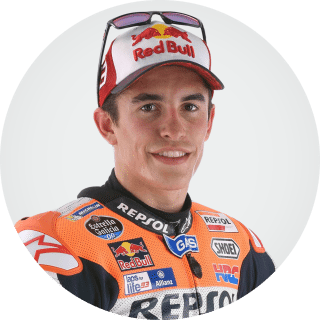 Since the circuit was added to the MotoGP calendar in 1999, he secured two wins in the premier class (2001 and 2008), scored seven second places (2000, 2002, 2003, 2004, 2006, 2009 and 2015), and secured two third places (2010 and 2014). This weekend he aims to score solid points again and reclaim fourth in the overall standings, bridging the two-point gap to the rival ahead of him. The Twin Ring Motegi circuit was built in 1997 and two years later it was visited by the MotoGP championship for the first time. It was added to the MotoGP calendar in 2000 as the Pacific Grand Prix until it replaced the Suzuka Circuit as the host of the Japanese Grand Prix in 2004. The 4.8 km-long Motegi track has six left and eight right corners and is one of the most popular events on the calendar. Race fans particularly enjoy its stop-start character, tight hairpins and slight elevation changes, as they always result in a weekend full of action. "The next Grand Prix, held in Japan, is very special for me since it's one of my favourites of the season and it's also the home race of Yamaha. I hope to do a good job and be able to collect more points for the championship, which is crucial to continue fighting for the title. For the next races we have to try to work even more than usual. We have to keep fighting and working with high motivation, even though it will not be easy to complete the last part of the season and bridge the gap between the championship leader and me. I will try to work even harder and I arrive in Japan with the aim to learn and be even stronger. I'm convinced that, with the support of the amazing fans at the Motegi circuit, we will be able to give our 100%." "After my return to MotoGP in Aragón, the work and my recovery have continued. It was good to have two more weeks after the last race to work on my rehabilitation, because now we will have three races in a row and it will be important to be in a good physical condition. I did everything possible to get pretty fit for the round at the Motegi track, because this is always a very important GP for Yamaha. I like this circuit very much and I'm glad to be here. We will do everything we can to get the best result possible." "Having made our way to Japan, we are about to enter the very crucial last part of the season. We start with the three back-to-back overseas races before the final round in Valencia. The triple-header is always challenging, because these GPs require a lot of focus, but we are eager to get started. The Japanese Grand Prix is very special for us because it's Yamaha's home race and the passionate fans play a big role in it - their support makes this round a great event for the entire team. Though the Motegi circuit can be quite a challenging track to find a good set-up for because of its stop-start nature, we've booked lots of successes here in the past and will again be pushing to the limit this weekend. Maverick really loves this track and with Valentino's condition improving day-by-day, we are looking forward to a great weekend full of action." Johann Zarco and Jonas Folger aim to kick-start the triple flyaway Grand Prix's in a positive way by powering to two notable finishes in Japan this weekend. Johann Zarco intends to build on his 6th place standing in the championship by concluding Yamaha's home Grand Prix inside the top five. Whilst Jonas Folger determinedly plans to return to form and seize the top independent honours in the 24 lap sprint on Sunday. FP1 commences at 09:55 local time, or 03:55 Central Europe, this Friday at the Twin Ring Motegi. "The Motegi event is approaching and I feel good after spending two positive weeks at home, where I gathered the energy that I need for the Japanese GP. It is a circuit that I like and the corners are nice, plus there are some hard braking areas. I have fond memories of Motegi because I won my first race in the 125 cc class there and I also secured the 2015 Moto2 World Championship at that round. I believe that I can be fast at this track with the Yamaha, but the team and I must work well. I think we will start with a solid base because we have a lot of references from the factory team. Then, I aim to give the maximum that I can and I really hope to be able to stay with the leading group. I would like to fight inside the top five, and why not go for the podium? It would be amazing to achieve this in Japan." "The Japanese Grand Prix is an important event because it's Yamaha's home round, and it also is for many of the staff in our team. The overseas races are always special as we spend a lot of time travelling together throughout the three or four weeks. We all get closer, which means that we enjoy the weekends more. I am looking forward to Japan and of course, the goal is to try and get back the speed that I had until the midpoint of the season. I'm sure that we can solve the issues and build up the confidence so that we will be able to get into the positions that we want to be in. I am optimistic and excited for this weekend, and I am sure that we can reach the goal that we have set ourselves." "The next round for us is the Japanese Grand Prix at the Motegi circuit. It's always a special event and is set in the remote but very picturesque and lovely countryside. It's a great pleasure to race there and the facilities are fantastic. Tech3 has been a Yamaha team for almost 20 years, so it means a lot to go to our manufacturers home GP. We have many friends inside the Yamaha group that have been with us in the past and that support our team and riders at every race. So we will be delighted, as always, to see so many friends from the factory as well as other places. The fans are really special and they often come with unique outfits to show their support! In addition, the people are very nice and polite whilst they wait to meet the riders in the paddock. The circuit is a track that both of our boys like a lot, but especially Johann. His first ever Grand Prix victory in the 125 class was at Motegi. We are excited and we have Sakura and many other Japanese partners who work with us, which makes this round even more special. In addition, this race is the first in the triple overseas events, and following this, we head to Australia and Malaysia so it's vital to do well in Japan and get some energy for the following two. Three in a row, with quite a long trip in-between each one, means we all use a lot of energy. It's a very tiring but exciting trip so let's start in Japan and hopefully we can score two great results to please the Monster Yamaha Tech3 fans who are superb and who always give us amazing support." The Octo Pramac Racing’s weekend at the Motegi Twin Ring circuit starts well. 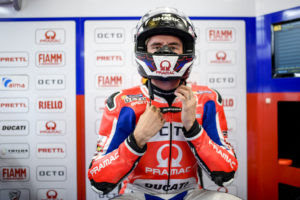 Danilo Petrucci overcomes the physical problems that debilitated him before his departure for Japan and finds a convincing feeling in wet Friday's free practices. The rider Terni ends up FP2 in 6th position setting the highest speed (299.0 km/h) recorded on the track. Scott starts well (3rd in FP1) but in the afternoon he doesn't manage to get back to the morning conditions, having to contend with lack of grip on the rear. The English rider finishes the first day of activity for the Gran Prix of Japan in 14th place. “It was a good day. This is a particular track, with excellent grip on the front but we will have to improve in braking areas. In the FP2 I did a long run with a very good pace. I missed the fastest lap but I'm satisfied. We will have to work a little bit on the set up but I am confident that we can stay with the leading group". “Things went well this morning. I had a good grip and the sensations were positive. In the afternoon we made some changes but I didn't find grip on the rear. If I have to be honest, I am a bit confused and I do not understand why I wasn't able to improve. We must work to find something that can help in sight of tomorrow’s qualifying”. It has been a positive day for the Team SUZUKI ECSTAR in Motegi, with both Andrea Iannone and Alex Rins into the top ten after the two free practice sessions. 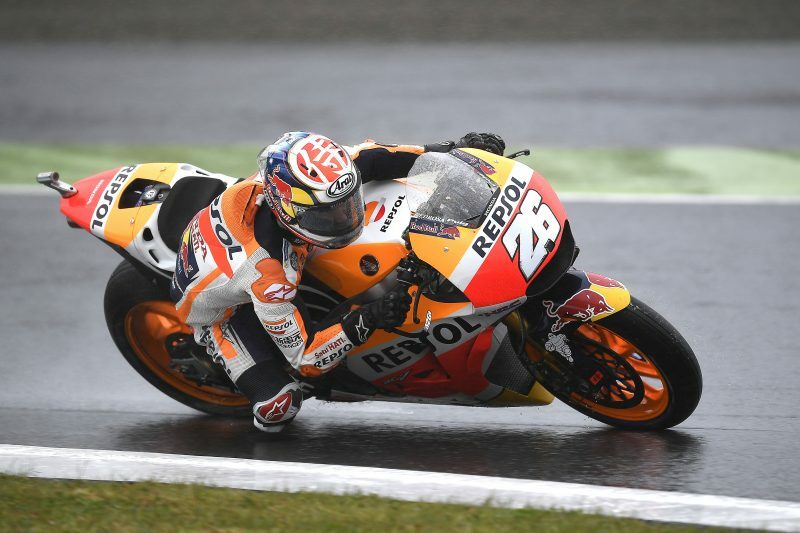 Both the riders were able to continue to improve throughout the practice sessions in the morning and in the afternoon, overcoming the difficulties caused by the rain. The Italian set his GSX-RR in 7th place thanks to the 1'55.614 lap time, while the young Spaniard grabbed 10th place with 1'56.229. Today Movistar Yamaha MotoGP's Maverick Viñales and Valentino Rossi prepared for an intense weekend at the Twin Ring Motegi track. The teammates searched for grip in the rainy first free practice sessions and took 11th and 12th place respectively in the combined timesheets, ahead of Sunday's Motul Grand Prix of Japan. The weather was the biggest challenge for Viñales this morning. He found himself starting Yamaha's home GP weekend in the pouring rain, and he had to up his pace gradually, careful not to cross the limit. Despite the treacherous conditions, which made it harder to get heat into the tyres and caused impaired vision due to the spray, he started working on his YZR-M1's setting. The Spaniard took ninth in FP1 with a 1'56.917s best lap, 1.499s from the front. The Yamaha Factory rider looked more confident during the second 45-minute session. Working on corner entry and minimising rear spin, he found a better pace, posting multiple 1'57s laps to ultimately secure 11th place with a fastest lap of 1'56.376s. He was again 1.499s from the leader and ended up in 11th position in the combined results. Teammate Rossi took his time in FP1 to get up to speed at the Twin Ring Motegi circuit. The track's various heavy braking zones make it vital to get the tyres up to temperature. Despite still recovering from his leg injury, the nine-time World Champion made progress, especially towards the end of the session, and finished 19th with a lap of 1'58.618s, 3.200s from first. With the weather conditions barely improving for FP2, the Doctor made some changes to increase downforce. He started working on the feeling of the rear of his bike going into the corners, and was able to improve his time by more than two seconds to a 1'56.435s by the end of the day. He finished less than 1.558s from the top, good for 12th position. The result also keeps him in 12th place in the combined times, ahead of tomorrow's sessions. "It's been challenging throughout the year to be strong in the wet. We didn't find a good set-up so far. The gap to the front is quite big, so we have to try to better the setting of the bike to improve the rear grip. It's a pity, because the conditions weren't really tricky and the grip level of the track was good. We still have tomorrow's sessions to find a solution." "I'm in some pain, but it's not a big problem. Unfortunately we struggle, because today we had two complete practices in the full wet and we could work on the setting, but both sessions were not fantastic. We are a bit in trouble, the bike is a bit difficult to ride and we don't have enough rear grip, so it's difficult. We hope that the conditions become better, or we try something tomorrow and we'll see." "We weren't expecting to face such difficulties today. Unfortunately, we struggled with a lack of rear grip, especially on corner entry, even though the grip level of the Motegi track is always good. Our performance level in wet conditions continues to be a point of improvement. We tried to solve this issue during today's wet sessions, but we didn't get the breakthrough we hoped for. Since we weren't ready to exploit the extra soft tyre, as we wouldn't have been able to enjoy its full advantage, we decided against using it, also because of the small quantity that we were given. The weather conditions are expected to remain the same, so we'll continue to keep pushing in the rain, because we're eager to make a big step over the weekend for Sunday's race." Johann Zarco showed his formidable form in the wet by closing the opening day of the Motul Grand Prix of Japan in 5th position. With rain expected for the entire weekend, Zarco got straight into gear and began undertaking the key setup work in preparation for Sunday's race. He notably finished the day only 0.407 back from the top three and as the leading independent rider. "I am feeling good and I'm happy to be in Japan. It's a shame to have the bad weather, however, I think that it could be an advantage for me. FP1 went well but then it was even better this afternoon. The others riders were really fast and Dovizioso rode an incredible lap time, yet I am not far back from him so I am pleased. I still need to work more with the team in order to feel as strong as possible on the bike because you can be fast for one lap, but the most important thing is to be quick on every lap, especially if it rains. I am working on it and I need to keep focused so let's see if we can improve in FP3 tomorrow, however, to be in the top ten at the moment is the main point. When it rains, it can be quite tough on a full power MotoGP bike because of the water on the track and there's a lot of spinning. Yet, we can see that the tyres are working really well and, along with the suspension and the bike, we have a strong feeling because this circuit has very good grip. If it stays like this for Sunday, it will be advantageous but we are working positively already." "Day one went quite well and it was enjoyable as well as exciting to compete against the fast MotoGP riders and this is good. I am confident in myself and although it is only the first day and it's too early to say which position I will finish in, I feel positive. Motegi is my local racetrack as my home is not so far from here. Tomorrow, it will be cloudy and the conditions could be dry, so the other riders will be faster. However, I am really enjoying this moment and I will try my best for the race on Sunday." The two Ducati Team riders both had an excellent start to their Motegi weekend today in the GP of Japan. 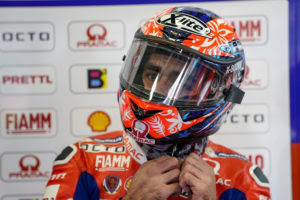 After the first day of free practice, which was held in the pouring rain and with an air temperature of 15° C, Andrea Dovizioso set the quickest time in 1’54.877 at the start of the second session, while his team-mate Jorge Lorenzo was classified fourth with a lap of 1’55.234. This morning the Spanish rider was the victim of a spectacular crash, luckily without suffering any serious harm, when he was hit violently by the bike of Cal Crutchlow, who had crashed a couple of seconds earlier while braking for Turn 9. 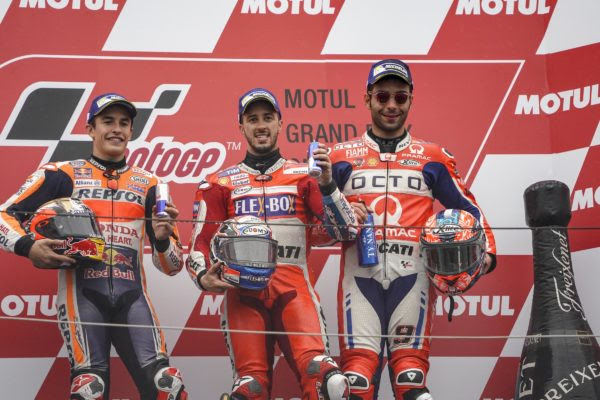 The two free practice sessions of the Japanese Grand Prix’s opening day were characterised by steady rain and cool temperatures, but Repsol Honda’s Marc Marquez showed a great pace from the beginning of the action. 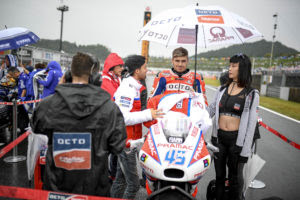 An extraordinary qualifying for Danilo Petrucci, who won second place on the #JapaneseGp starting grid, giving Octo Pramac Racing the fourth front row start after Barcelona, Assen and Germany. 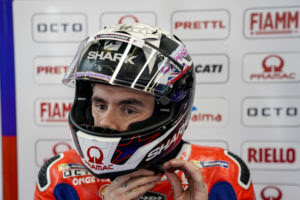 For Scott Redding a negative Saturday as he was unable to solve the grip problems already experienced in free practices. Rain gives a respite after Friday’s showers but the circuit remains wet and slippery, forcing the riders to dispute qualifying with wet tyres. 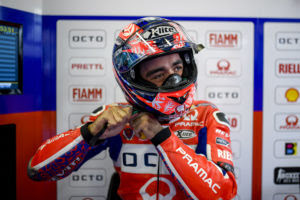 Petrux (directly qualified to Q2 after P6 of FP2) starts very strong and after the first run is second. The track starts to dry and the lap-times drop. The rider from Terni gets back to the track and pushes hard. After the T2 of the last lap he is the fastest on track then a small mistake caused him to lose precious tenths from the pole-man Zarco. The second place ahead of Marquez is celebrated by the team at the Parc Fermé of the Twin Ring Circuit in Motegi. Scott Redding never manages to be incisive. A crash at the start of FP3 removes the confidence of the English rider who continues to struggle due to a lack of rear grip. Scott finishes in P22. “I'm very happy because I didn't expect it. This morning the feeling wasn't perfect and I couldn't be as fast as I hoped. In qualifying we made a very good strategy by making the most of the time available. It's a pity that I made a mistake on one of the last corners otherwise I could have finished with the pole position. But it doesn't matter. The front row start is very good and starting ahead is very important in this circuit. I am very confident for tomorrow”. “I have never had feeling. I had the same problems experienced on Friday and this morning's crash didn't help me. I cannot understand why we have lost our way completely. In qualifying, even when the track was starting to dry, I tried to push hard but I was a second slower than in wet conditions. Am I myself? Is the bike? Is it the setting? Tyres? So many questions around. We have to find somehow a solution for tomorrow”. Today’s qualifying session saw Alex Rins and Andrea Iannone secure two solid places in the top 12. The Spaniard´s best time of 1’55.483 was worth 10th place on the grid, and the Italian is immediately behind in 11th place thanks to posting his best of 1’55.717. The progress seen yesterday was confirmed in today’s sessions; Andrea Iannone and Alex Rins were both able for the first time to get direct access to Q2 after the third free practice session. The new aerodynamic fairing helped the riders to achieve a better feeling with the front end and their performance in wet conditions was fast consistently. In the morning Iannone was the third fastest of the session (1'55.499), giving him 7th place in the combined classification, while Rins ended in 6th thanks to the 1'56.139 that also put him in the 10th place in the combined. More challenges came in the Q2 session, as the track was in mixed conditions, but not truly wet. The factory riders were not able to take advantage of all the lessons learned from the previous sessions. Despite consistently being at the top of the sheets for the majority of the session, they could not be as effective in the last laps, losing positions and having to settle for 10th (Rins) and 11th (Iannone) places. The fourth row start may necessitate a so called a recovery race, whereby the riders are forced to look for any opportunity to advance their position in the race, although the feelings of riders and of the team are confident. Movistar Yamaha MotoGP's Valentino Rossi took a tyre gamble in Q2 at a drying Twin Ring Motegi track and secured 12th position. Teammate Maverick Viñales came just short of getting promoted from Q1 and will start tomorrow's Motul Grand Prix of Japan from 14th place on the grid. Circuit conditions were uncertain as a dry line started to form at the start of the second 15-minute shoot out. Unharmed after a crash in FP4, Rossi quickly went out on track in Q2 and took a risk, putting on slick tyres. Though he booked consistent improvement on each lap as the tyres started to warm, his gamble didn't pay off. The Italian returned to the pits in 11th place, with five and a half minutes on the clock. He soon exited pit lane for another go, this time on wet tyres, but at the end of his out lap there were only one and a half minutes of the session remaining, which meant he would only have one attempt to set a fast time. The Doctor put the hammer down, dropping a 1'57.786s lap, more than 12s quicker than he was on slicks, but he didn't gain a position and had to settle for 12th place, on the fourth row on the grid. After finishing outside the top-10 in this morning's FP3 session, Viñales had to enter Q1 but looked to be a strong contender for advancement to Q2. The Spaniard didn't linger at the start of the first qualifying heat and immediately set the provisional fastest time on his first flying lap, but dropped back to third place when he visited the pit box to put in an extra soft tyre. He was sitting in fourth position when he resumed his attack and set a 1'55.916s for second place, but was pushed back two positions in the final stages. Back in fourth place, the Factory Yamaha rider put this head down once more, but was unable to further improve his position in the timesheets. He will start tomorrow's race from fifth row on the grid, from 14th place. "This morning we started well, because with the full wet session, like yesterday, we improved the setting of the bike a lot. I was quite fast and it was good, but unfortunately with less water on the track we suffered a lot. Also for this reason we risked using the slicks, because the track was becoming dryer. We were hoping it would dry quickly, but unfortunately it was still too wet. We have to wait to see what the conditions will be like tomorrow. With more water on track we can be quite strong, with less water we're struggling. The crash in FP4 was quite big, but I was lucky. No problems, just a little bit with the finger, but the important thing is that the leg is OK."
"I had the same problem today as I had all year in the wet: I had a lot of spin and couldn't ride the bike the way I wanted to in these conditions. We are working hard and giving it everything. The qualifying result is what it is and now we focus on working for tomorrow. We know where we're losing time, but it's difficult to fix it in just one weekend. We are going to do our best, we'll try to improve for tomorrow and score as many points as possible." "Today's results were not what we had hoped for. The changing circumstances on the circuit in Q2 made it difficult to understand what the track conditions would be like. Valentino decided to try the slick tyres, but it turned out that, despite the drying line, it was still a bit too early for slicks. When he opted for a wet tyre for his second stint he just ran out of time to make it work. Though he improved his time significantly on his last lap, he still has to start from 12th place on the grid. Maverick was on the attack in Q1 and set a 1'55.916s on the super soft tyre. It was a shame that he missed out on advancing to Q2 by just 0.072s, because starting from the fifth row is quite challenging. Now we will assemble the data from today's sessions and prepare some setting tweaks we can test in tomorrow's warm up." Monster Yamaha Tech3 team rider Johann Zarco delivered a master class performance today to clinch a superb second pole position in his rookie MotoGP season. The French star progressed through to Q2 courtesy of his FP2 time, and here, he battled against the drying yet slippery track, before storming to the top on his penultimate lap. Tomorrow, the highly impressive rookie seeks to scoop his second podium of the year at Yamaha's home Grand Prix. Meanwhile, Kohta Nozane, who is standing in for Jonas Folger at this round, endured a challenging qualifying campaign after experiencing a crash in FP4. The young Japanese rider tried to persevere in the Q1 shootout but he was forced to abort due to a hand injury. Nevertheless, Nozane aims to compete in the race, which begins at 14:00 local time, or 07:00 in central Europe. "I am so happy about this pole position. The team and I did some great work since FP1. There, it was raining all the time, and I think that I improved the feeling of the bike a lot, plus I have grown up in this condition. For qualifying, it was a bit different because the track was drying, but not enough to use the slick tyres. However, I knew that I could feel really good and try things in order to be faster than my opponents in these conditions. It worked and I am so happy for that. Now, I need to use this opportunity to stay in front, whether it rains or not, and do the best race that I can and I will dream about the podium." Triumph in Japan. Dovi plays the Italian Anthem. Petrux sings it on the podium after a fantastic race. 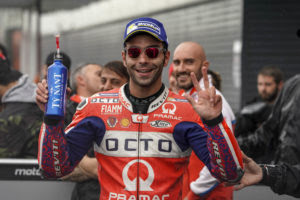 Once again on podium, another success for Octo Pramac Racing - that thanks to Danilo Petrucci - joins the Ducati party for the awesome victory of Andrea Dovizioso. Petrux is the protagonist of a fantastic race, dominated for 12 laps and then ended up with the joy of the 4th podium in this 2017 stunning MotoGp season. For Scott Redding a very difficult weekend but also an encouraging comeback from 22nd to 16th. The first laps of the Gran Prix of Japan are a spectacle for millions of spectators connected from all over the world. Starting from P2 Petrux engages in a good duel with Lorenzo and Zarco, then fights with Marquez. Halfway through lap-2 the rider from Terni passes Jorge and takes the lead. His lap-times are explosive and allows him to make a vacuum. Danilo leads up until half race then must undergo the return of Marquez and Dovizioso. Petrux tries to fight for victory then holds an extraordinary 3rd position, 10 seconds ahead of Andrea Iannone who finished 4th. A weekend to forget for Scott Redding. The English rider never managed to find a good feeling during practices but since the first lap tried to push to bring home a few points. On lap 7, he overtook Smith for 13th place but he couldn’t keep a good pace and had to settle for 16th place. “If I have to be honest, my desire is to forget this weekend as soon as possible. I never found a good feeling and I could not make any progress after FP1. I tried to push in the race as well, but I had problems. I found the feeling of Fridaymorning after a few laps but I wasted a lot of time starting from behind. In the last laps I had problems with aquaplaning that didn't allow me to gain more positions. There are three races missing and I want to give the maximum to finish in a positive way a very difficult season for me”. Today Movistar Yamaha MotoGP's Maverick Viñales put in a consistent ride at a very wet Twin Ring Motegi track to secure ninth place. Valentino Rossi had an impressive start to the Motul Grand Prix of Japan and was riding in eighth position when a crash in turn 8 brought an end to his challenge. Viñales had a great start to Yamaha's home race, riding midfield through the spray from a 14th-place starting position to eighth in the opening lap. He had to let Alex Rins and teammate Rossi past on lap 3 as he warmed his tyres, but this setback was only temporary. The Spaniard overtook Jorge Lorenzo three laps later, while Rossi crashed out of the race, and reclaimed eighth place. 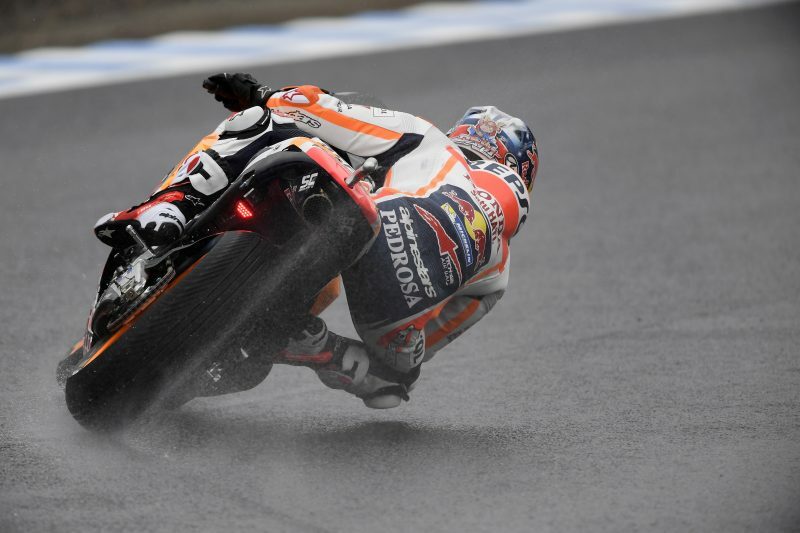 He gradually started to up his pace as his confidence grew at the very wet Motegi track, but soon realised Aleix Espargaró, riding directly in front of him, was too far ahead. In the second half of the race Viñales focused his attention on defending his eighth place from Lorenzo, who arrived at the back of his Yamaha with six laps to go. The number-25 rider put his head down, but was unable to hold off his compatriot. He crossed the line in ninth place, 36.575s from the front. Rossi also had a good launch off the line, starting from 12th on the grid. He quickly began his charge and had picked up three positions by the end of the first three laps. The Doctor spurred on his YZR-M1 to prevent his rivals from clearing off at the front, overtaking Lorenzo on lap 6. However, his pursuit came to a premature halt when he suffered a crash in turn 8 and was unable to rejoin the race. Today's race results see Viñales and Rossi hold third and fifth place respectively in the championship with a 41 and 76 point-gap to the leader. Yamaha is in third place in the Constructor classification, 29 points from first, and Movistar Yamaha MotoGP is chasing the Team title in second place with 43 points to the top of the rankings. The team will soon head south to take part in next week's Michelin Australian Motorcycle Grand Prix on Phillip Island, Australia. "I expected things to be a little bit worse, because this morning I was trying to be in the top-15. Finally, in the race, I pushed a lot in the beginning. I tried to risk only the necessary, trying to give our best. Today this was the maximum and we will have to think now about Australia. Until all the points are collected it is impossible to know if there is still a chance to win the championship. For sure we we'll face different circumstances in Australia. It will be a different bike and different tyres, we don't know what we're going to have there, but it's a track I like a lot, I like to ride there, so I can't wait to be on the bike again." "Today was the end of a very difficult weekend. Because of the wet conditions I was not very competitive, I was struggling a lot with the wet setting of the bike. In the race I was trying to follow Aleix Espargaró and I was trying to stick with him, but unfortunately I crashed. Now we'll try to do some good races and it will be important during the next weekends to give Yamaha as much information as possible to improve the bike and to decide on the direction for next year." "When we arrived here in Japan, we weren't expecting this weekend to be as difficult as it turned out to be. We really worked hard to try to find a solution. We put in a lot of effort, but we weren't able to do it in the end. We never found the rear grip that the riders were looking for in almost all the sessions, as well as in the race itself, but Maverick and Valentino tried to make the best of it. We know that we have a lot of work ahead of us, and I expect that we will use the next round to explore different solutions for the future." Monster Yamaha Tech3 Team rider Johann Zarco experienced a challenging afternoon to finish the Motul Grand Prix of Japan in 8th. The French star lunged forward from pole position as the rain continued to pour. After relentlessly battling at the front of the field for the opening laps, he settled into a formidable rhythm as he battled against the gruelling conditions. Eventually, he powered across the finish line and now optimistically awaits the Australian Grand Prix next week. Meanwhile, substitute rider Kohta Nozane endured a tough time after falling in the early stages of the race. The promising young Japanese rider who was riding with a small fracture in his right hand following a crash in FP4 yesterday made progress after the start before unfortunately sliding off on the 4th lap. Monster Yamaha Tech3 would like to thank Nozane for his efforts during the Japanese Grand Prix. "It was a tough race. I had a good start and the feeling was quite ok at the beginning. However, the rear was sliding a little bit but I was able to control it and overall, the front felt great which allowed me to brake how I wanted to. I was slightly limited with the corner entry yet, on the whole, it was positive. Some riders overtook me but I managed to stay with them, even if I lost a bit in acceleration. This means that we are doing a good job as we can make this same step in the wet as well as the dry. I waited when I was running in 4th and I thought that I would get more confident with the front and then catch the leading group. Yet, the opposite happened and despite the fact that I always felt good on the brakes, the tyres wore, which limited me. By the end of the race, there was a lot of spinning and even though I tried my best to find a solution on the straight by carefully opening and closing the throttle to catch some grip, the other riders got past me. This was why I lost the positions at the end but we will try again in Australia next week." "After the warm-up session, under a local anaesthetic, I decided that I could race today. The track conditions were pretty bad this afternoon when compared to this morning. If I was not injured then I could have managed the GP better, but the fact is that I crashed quite early on. I am frustrated with myself and I have to say sorry to Yamaha and to the entire team. However, these three days have been like a dream and again I would like to thank Yamaha and Hervé for trusting me!" "Altogether I believe that it has been a positive weekend for the Monster Yamaha Tech3 Team. It was an incredible feeling on Saturday to get the pole position with Johann Zarco for the Motul Grand Prix of Japan. This was special for us all and also for our partners, with Motul being the title sponsor for this race and I'm sure it's something that they enjoyed. We knew that today was going to be very difficult as the conditions were really challenging and almost dangerous. There was a lot of standing water on the track and it never stopped raining. Yet, Johann had a great start and stayed behind the top three for most of the race. However, we knew that the end of the GP would be tricky and Johann quite easily kept the riders behind him until the last five laps, and there we couldn't fight anymore as there was no more grip on the rear tyre. To lose four positions in the final few laps is not something that we can be happy about but 8th is still a good result and we collected some valuable points. Overall, the weekend was positive and I would like to thank Yamaha for looking after us in the way that they did. On the other side of the pit box, Kohta Nozane was really impressive on Friday and we thought that he would eventually be fighting for a top ten finish on race day. Unfortunately, a small mistake at the beginning of FP4 saw him crash and fracture his right hand, which meant it would be very difficult. Yet, he never gave up and worked hard throughout the night to get his hand fixed. The warm-up went well, so we thought it was ok to compete. However, I think it was just a bit too much and he wanted to start his home Grand Prix so we gave Kohta the chance and I'm happy we did. Yet, we were not very confident because we could see how badly his hand was and at such a hard braking circuit, with a fractured right hand, it was almost impossible. I would like to thank him and I think he has shown that he has a really good level and he could be a very successful MotoGP rider in the near future. I don't know what Yamaha has planned, but it was a pleasure for us to look after Kohta. He is a really nice guy and we would eventually like to give him another chance to show his full potential. Thanks to the whole team and we will pack everything tonight and then head to Australia where we hope there will be no rain." Jorge Lorenzo eventually finished in sixth place after starting from the second row. The Spanish rider got off to a good start and led during the opening lap, but then dropped a few positions following a contact with Zarco and suffering from a poor feeling with rear tyre grip. Six laps from the end Jorge began his recovery from ninth and after passing Viñales, A. Espargarò and Zarco, he finished the GP of Japan in sixth place. Thanks to today’s result, Ducati moves into second place in the Constructors championship with 273 points. 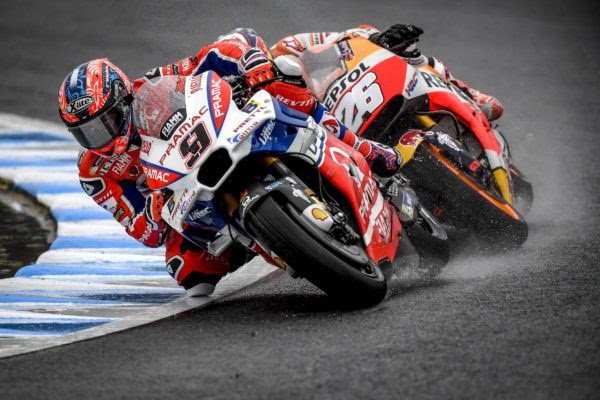 MotoGP returns to the track next weekend at the Phillip Island circuit, the venue for the Australian Grand Prix.